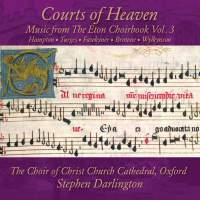 The first disc in this series, More Divine than Human (Fanfare 33:2), offered five works drawn from the Eton Choirbook, the sole remaining witness to the glories of early Tudor church music. Choirs of Angels has five more, two of them unrecorded, and the newest issue gives us five more works, four of them never recorded before, bringing the total of pieces recorded from this source to 40. (Timothy Symons, the author of the excellent and detailed notes on all three discs, claims that nine pieces are premieres, but he overlooks three that once appeared in the LP era.) On Choirs of Angels, Browne’s O Maria, salvatoris mater is in Peter Phillips’s disc devoted to that composer and in Harry Christophers’s fourth disc in his series, now on Coro. The Cornysh piece is the most frequently recorded work in the whole collection, just recorded again by the Hilliard Ensemble (38:3). The Wylkynson piece has been recorded six times and is included on Christophers’s third disc, also now on Coro. The Davy and Lambe pieces are first recordings. On the newest disc, Browne’s O mater venerabilis was recorded only by Miroslav Venhoda on LP, so it is almost as inaccessible as the four pieces on the disc that are first recordings. Most interesting, the concluding piece is Wylkynson’s five-voice setting of Salve regina, better known in his nine-voice setting. It would be easy to repeat the notion broached in the first review that the contrast of these boys and men is the chief feature that distinguishes their Eton anthems from nearly all other recordings, which were made by small adult vocal ensembles, even if the women in those groups try to produce the vibratoless sound typical of boys. But there is more. Darlington’s choir numbers 33 or 34 singers, but it sounds much smaller until a climactic passage resounds. The solos are uniformly fine, with all the treble solos on the third disc credited to one amazing boy. Where comparisons are possible, as in the oft recorded Ave Maria, mater Dei of Cornysh, Darlington takes a tempo close to the slowest on record (the Scholars and the first of three Harry Christophers versions), but he lets it unfold with great dignity and power. The Hilliards in their most recent release also have power in this piece, but their single voices are individually prominent whereas these choral voices are blended. 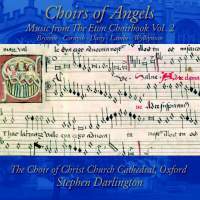 If you want to hear these masterly anthems in extenso, you could not do better than to compare the five CDs by Harry Christophers on Coro with these three by Darlington. You will find Ave Maria, mater Dei by Cornysh, In honore summae matris by Richard Davy, O Maria, salvatoris mater by John Browne, Salve regina a9 by Wylkynson, Salve regina by Cornysh, and Stabat mater by Browne in both sets—only six duplications—and you will have about 30 of the 40 works that have been recorded. The Eton Choirbook has never been so accessible on records. Do not fail to hear this awesome music.